This is my most recent Dob, a 10" f/5 travel Dob that I have built during winter 2011/12. 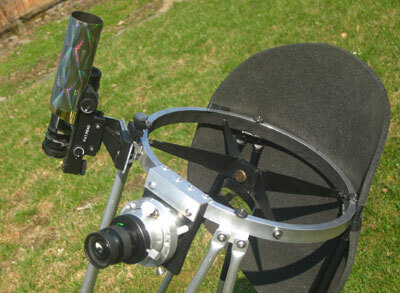 the telescope should fit under the driver's seat in the car with the poles under the back seats (the box should therefore be no wider than 32 cm and no higher than 17 cm, while length could be up to 40 cm. I had built a small 8" travel Dob 10 years ago, but this handy little telescope had too many restrictions: It was to lightweight, could hold only 1.25" eyepieces, had not optical finder, had a very minimalistic design, and was, due to its f/6 focal ratio, prone to vibrations. 2" eyepieces and an optical finder mean a lot of weight at the long end of the telescope. It was obvious that the mirror had to compensate for quite some amount of torque. A relatively thick and heavy mirror was therefore necessary. The maximum width of 32 cm restricted the aperture to 10". 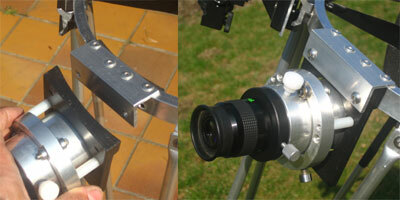 I chose an inexpensive GSO mirror with a thickness of 35 mm and a weight of 4.5 kg. 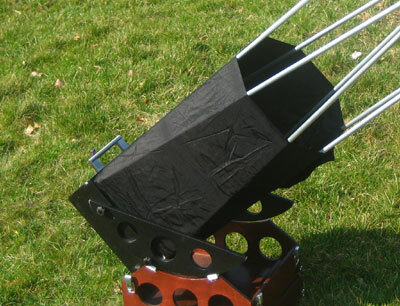 The remaining telescope structure, including finders and baffles tips the scales at around 6.5 kg, yielding a total weight of roughly 11kg. ... consists of a single 10mm × 20mm aluminum ring with 280mm inner diameter with a light baffle made of a 10 mm foam mat. 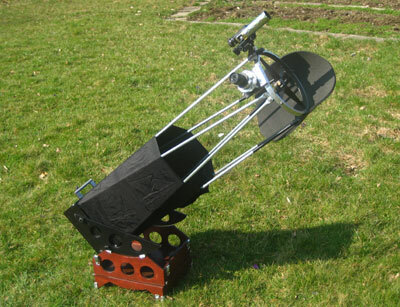 ... is of the Ross-Sackett-type and has proved well already in one of my smaller telescopes. 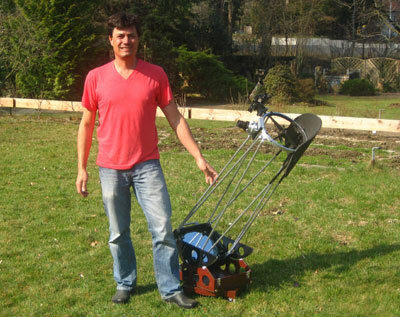 It is compact, stable, and easy to adjust. For transport, the secondary holder including the secondary (50mm minor axis) can be removed from the spider by means of a thumb screw. The spider is eccentric, which minimizes torsional movements already at low tension of the spider legs. The spider is made of 0.3 mm brass that can be cut already with scissors. 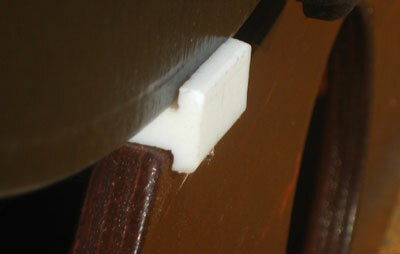 The spider legs are glued to slotted bolts with heavy duty epoxy glue. 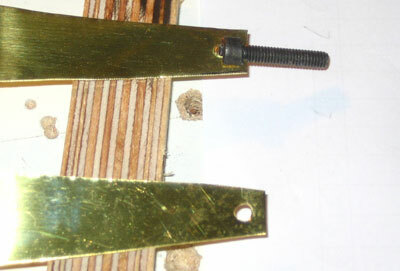 The small hole in the brass sheet considerably increases the stability of the glued joint. 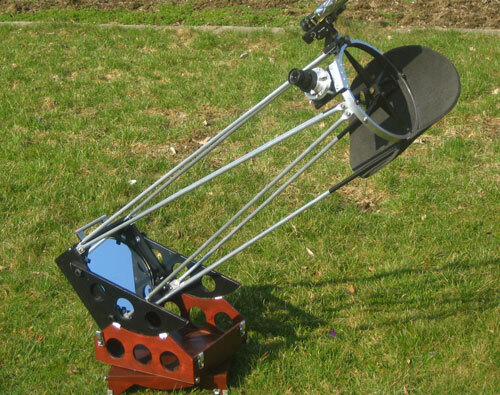 ... is a Helical Crayford that was made by a friend of mine similar to the Kineoptics HC2. The focuser board can be separated from the upper ring for transport. There are two finders at the upper ring, a red dot finder and an 8x30 optical finder consisting of one half of binoculars with integrated cross hairs. 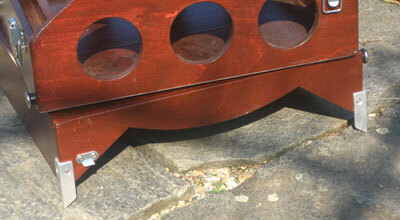 ... is made of 9mm plywood with a 6.5mm mirror baffle. 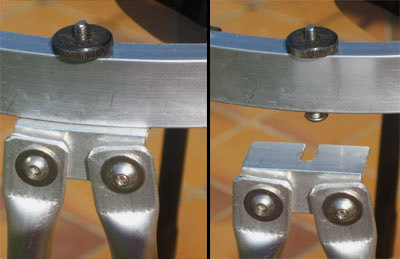 All parts of the box are connected by groove and tongue, similar as shown here. The altitude bearings are made of 12mm plywood. 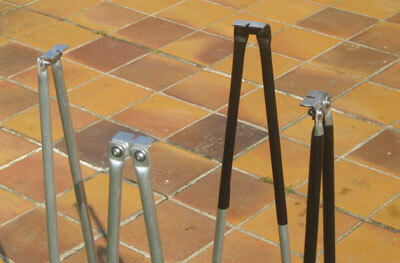 ... is made of 10mm × 20mm Aluminum tubing, riveted, with 6 supports. The mirror is laterally supported by two plastic screws. This is sufficient considering the thickness of the mirror, given that the mirror does not need to move in its cell during collimation. Collimation is achieved from above by two M6 threaded rods that are bolted to the horizontal beam of the mirror cell, via two spring-loaded knurled nuts. 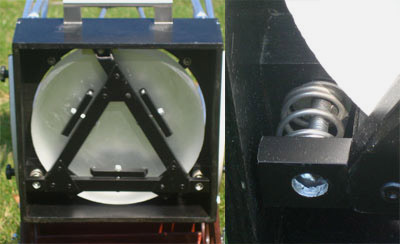 The third connection point between cell and box is not used for collimation. During transport, the mirror is locked in its cell by the mirror cover. The cover has three little wedges at its rim, that push against the bevel of the mirror. 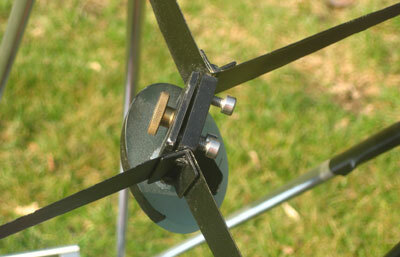 Everything is held in place by the four rotating mirror clips. 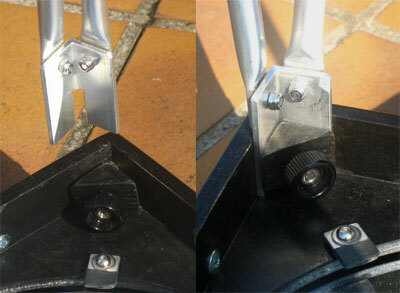 ... is attached to the lower end of the telescope by Velcro bands. ... is made of 9mm plywood, similar as the mirror box. 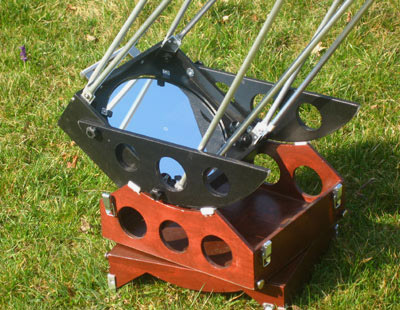 The ground board forms a lid to the rocker box, containing the entire telescope. This is similar to the concept made up by Pierre Strock, that had been copied over the years by many others. 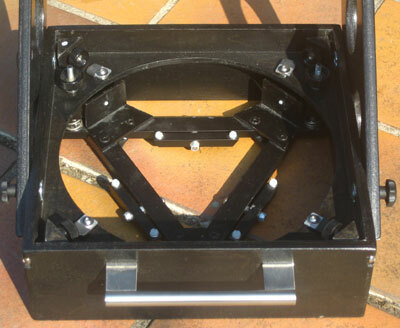 At the corners of the ground board (actually it is a "ground box") are for aluminum claws that can be pushed into the soil. 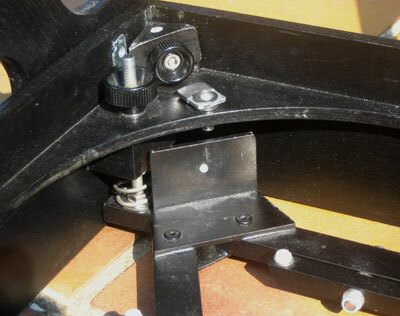 This fixes the telescope on the ground and increases the stability of the scope during operation. The teflon blocks of the altitude bearings are designed to guide the altitude wheels and to prevent them from slipping off. The bearing surface is a relatively smooth laminate that has more friction than the commonly used Ebony Star. 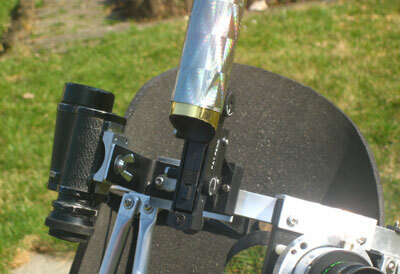 This helps in particular for smaller, lightweight Dobsonians to stay put when changing eyepieces. ... is made of 10mm × 1mm aluminum tubing. The truss frame consists of the 8 poles which are connected pair wise at both the upper an lower ends, forming thus a single structure. The ends of the poles were squeezed flat in a vise. The upper pole seats are similar to those of my other telescopes. Instead of quick release levers, I have used here bolts and thumb screws. This type of pole seats makes for a very rigid connection without any loose parts. The connected poles allow for a very easy setup and facilitate quick connection with the upper ring. At the lower end, the poles connect to the corners of the mirror box via four aluminum brackets. The mirror box is held within the rocker box by several small wooden bars. 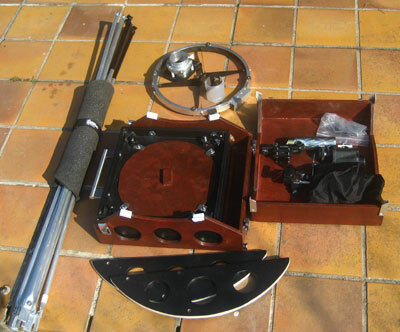 Both finders, the upper ring, secondary mirror, focuser, light shroud, altitude bearings, eyepieces, and finders fit into the box. Only the poles and the light baffle go extra. The "ground box" forms the lid of the box and helps as well to lock the mirror box. Both halves of the transport box are connected by levered clamps. The entire box can be carried by a handle attached to the mirror box. Here the box is ready to go. It measures 35cm × 31cm × 17cm. The bundle of poles is 104cm long. The total weight of the entire telescope is roughly 11kg (without eyepieces, but with both finders).